Leribe held its second mapathon after the first one in August 2015, which is a long time ago now. The mapathon was held at Hlotse Urban council on the 20th and 21st of June 2016. Day one was basically understanding the instructions of the task and helping each other to re-set their passwords and have everyone ready to start mapping. In essence we were all set for mapping at 14:00 and with the 11 community councils and 2 urban councils; we agreed they each one of us should focus on their own council to make it easier and more accurate. On the second day; mapping became easier as most of us were getting used to other mapping tools. 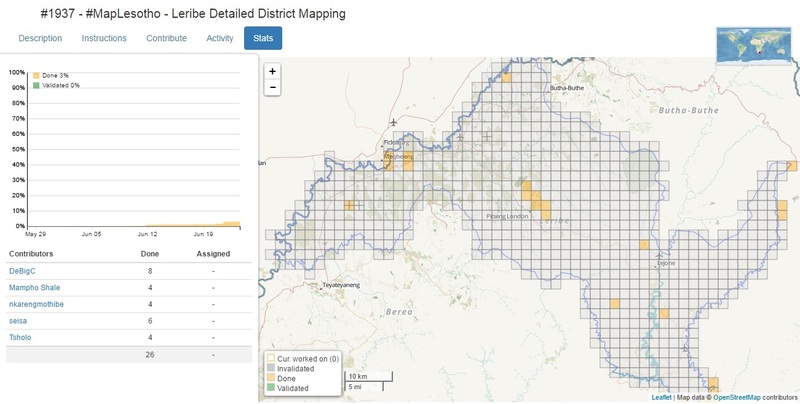 In Leribe most Assistant Physical Planners use ID editor while only two namely Tsholo and Seisa use JOSM and although we’ve mapped just a bit of our district, we have just started and won’t stop until Leribe is all yellow and ultimately green. Much appreciation to the Fingal County Council for continued support. We were glad to hear that the Memorandum of Understand will live longer.